There has been increasing interest in using robots to help the surgeon perform complex surgical procedures within small spaces thereby saving the patient more invasive incisions. Especially in the world of ENT, surgery that may have required large incisions to the face and/or neck can now be accomplished without any incisions by using robotics to perform the same surgery, but entirely through the mouth. Such robotic surgery performed through the mouth is called Trans-Oral Robotic Surgery, or simply TORS. 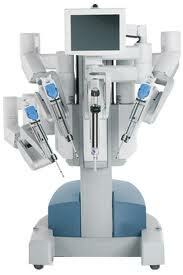 The DaVinci system is the robotics platform that is most commonly used in TORS. Using TORS and other approaches, head and neck surgeons have been able to remove the thyroid gland through the armpit, perform base of tongue cancer surgical excision (same cancer that Michael Douglas had), voicebox removal (laryngectomy), vocal cord surgery, etc. In many of these and other surgeries, any procedure performed through the mouth traditionally was limited to two hands. With the DaVinci system, one technically can fit as many as FOUR "hands" inside the mouth enabling greater surgical flexibility and ease in performing fine dissections that otherwise would be impossible. There are some downsides however... namely, use of robotic surgery is not compensated by insurance and as such, major medical centers are the only locations where such high-tech equipment is available. At this time, the otolaryngology department at Johns Hopkins University, George Washington University, and University of Virginia are the only locations in the mid-Atlantic region with access to such robotic technology and the otolaryngology-head and neck surgeons who know how to use it that I'm aware of.